Sometimes when I read a book, I know immediately it’s going to be made into a movie. It may be a creative, eerie, beguiling setting (like The Night Circus). Or exciting, crazy action (like The Hunger Games). Or just a really great story (like Matilda). The blurb screams rom-com. It’s As Good as It Gets all over again. So, obviously, I knew what I was getting into when I started this book: complete fluff destined for the big screen (which is exactly what I wanted–I felt like I deserved it after reading The Orphan Master’s Son). A purpose-built, scientifically valid instrument incorporating current best practice to filter out the time wasters, the disorganized, the ice-cream discriminators, the visual-harassment complainers, the crystal gazers, the horoscope readers, the fashion obsessives, the religious fanatics, the vegans, the sports watchers, the creationists, the smokers, the scientifically illiterate, the homeopaths, leaving, ideally, the perfect partner or, realistically, a manageable short list of candidates. But remember: this is a rom-com, so fate has to throw a wrench in Don’s plans! Enter the “totally unsuitable” Rosie. Can she crack Don’s unemotional façade and convince him to abandon his strict love guidelines? Can Don fall for someone who doesn’t follow a rigid schedule? Can Rosie love someone so regimented and quirky? This book is exactly what you would expect it to be: silly, utterly unrealistic, and completely mediocre. The writing is unremarkable. Don’s idiosyncratic voice is occasionally funny (to get a feel for it, you can read an excerpt here). The characters are eccentric and likeable. If you’re looking for a summer beach read, this fits the bill. It’s as mindless and happy-go-lucky as any chick flick. Who should read it: If you love romantic comedies (the cheesier and cutesier, the better), then this is the book for you. 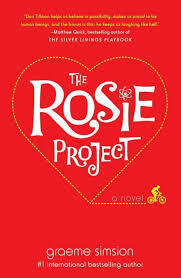 This entry was posted in Rating: 2.5/5 and tagged Book review, Books, Graeme Simsion, The Rosie Project. Bookmark the permalink.